So how do you decide whether you should go to the doctor, or whether Teladoc is the right answer? 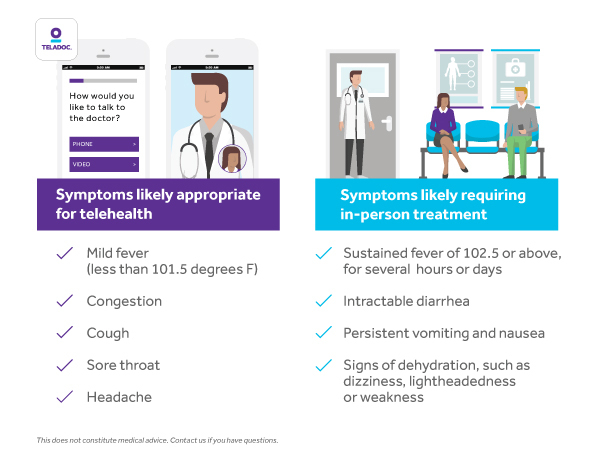 Here are a few pointers on when your symptoms are likely appropriate for telemedicine, and when you should schedule time with your doctor or urgent care. Teladoc is a benefit typically provided to you by your employer or health insurance plan. Not sure if you have Teladoc? Ask your HR or benefits manager about your eligibility today.